Life is blossoming for the Tree of Life team (South London & Maudsley NHS Foundation Trust, SLaM) following its success at the National Mental Health Positive Practice Awards at the Hilton Hotel, Newcastle. 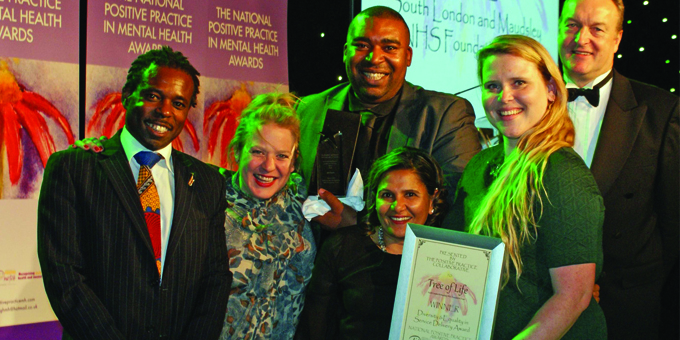 The team won the Diversity and Equality in Service Delivery award and was Highly Commended in the Patient Experience category. The project aims to promote recovery and compassion on wards through growing more positive relationships between staff and service users. In the co-led workshops, service users and staff come together to draw their own tree (a form of ‘narrative therapy’) and create a forest together. The team was set up by Dr Julie Fraser, a clinical psychologist at SLaM who recruited assistant psychologist Laura Williams to train ten service users from the community to co-facilitate the workshops on wards. Maggie Hayes, Ursula Joy and Ubong Akpan have been working on the project since the beginning and run workshops across SLaM every week. The team also provides training to SLaM teams and teaching sessions at the Recovery College. The team’s success just keeps rolling. Says Julie: “The Tree of Life workshops on the wards has been submitted to the Race Equality Foundation as an example of good practice and our work was also mentioned in the recent SLaM Care Quality Commission report under ‘good practice on acute wards’. “Following the Maudsley charity two year funding, we have been funded until the end of March 2016 by SLaM. We are currently running workshop three times a week across the 17 acute and three Psychiatric inpatient care units.” The team recently took part in a film, financed by the Maudsley charity, and directed/produced by the Recovery College filmmaker Steve Tart. It will be used for training, recruitment, publicity and education purposes. They were also interviewed by Radio 4’s All in the Mind programme, which will be broadcast in December. Click here to read Ursula’s blog about her Tree of Life experience. Click here for more information on the Awards Body.